I remember the first time I heard the term westcoasting used. It was one of my dad’s old climbing pals and he said something along the lines of: ‘Ach, I’ve no seen Rab for a few weeks. He’s been aff westcoasting.’ Rab had emptied his pockets of money and, with just a sleeping bag, a knife, stove, a fishing rod and a few tins of sardines, taken himself off to somewhere on the west coast to walk, sleep out, catch trout, scramble up hills and wash in burns. He might have taken a gun to shoot rabbits as well. He wasn’t going anywhere in particular. What he was doing was paring life right back to the bone – remembering what it’s like to fall asleep in the moonlight and how endless the stars seem in the dark, untamed night. Then recharged, he’d returned home, smelling of woodsmoke, paraffin, peat and the past. 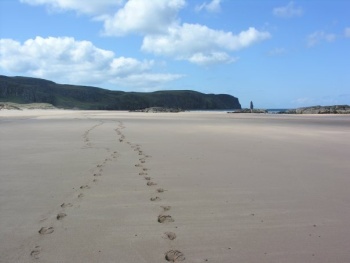 The beautiful Sandwood Bay in Sutherland. It's about a four-mile walk in and a great place to wild camp. Westcoasting. I don’t know if anyone else uses the term, or it was just something my dad’s friend made up, but I love it. It sums up something that’s been my touchstone wherever I’ve been in the world, reminding me where I come from and what life can be about. 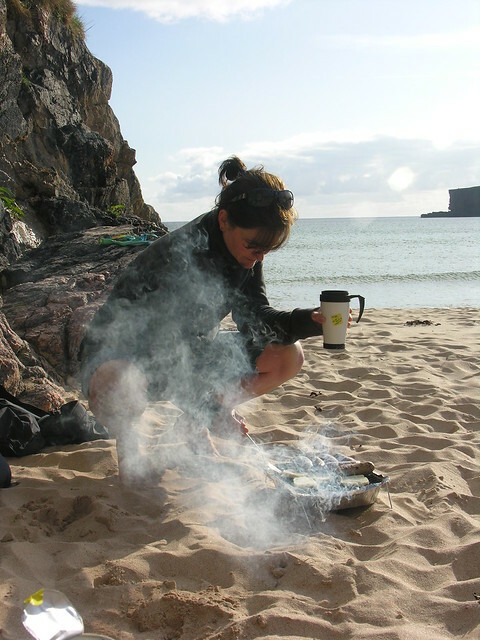 For me westcoasting is the smell of bracken, wild thyme and bog myrtle, fat mackerel fresh from the sea sizzling over the glowing embers of a beach fire, a bottle of wine chilling in a rock pool, the walk into Sandwood Bay, unzipping the tent and stepping on the dew-damp grass on a hushed, early morning – just you, the silence, the view, the space and a sheep or two. Having the time to let it seep into your very being. It’s as much about the stories I’ve been told as the places I’ve been to. Stories passed on to me over the years and treasured until they became mine. The west coast stretches, in my mind at least, from the Kintyre Peninsula in the south up to Cape Wrath in the north, taking in the Western Isles in all their glory along the way. But this isn’t a rigid definition; westcoasting is, afterall, inspired by the place rather than defined by it. It’s about the raw, rugged beauty of this area, its wilderness and sheer space, the opportunity it offers to get lost, the way that the weather shapes life, the battered coastline, the bountiful sea, the sweet water from the mountain springs. The west coast has a romantic glint in its eye and if you’re someone who hankers after something more wild, it’s bound to seduce you. Before long, you’ll be westcoasting – providing you can handle the midgies of course. Looking forward to some westcoasting weekending (to use another of the dad’s expressions) this summer! He’s got a way with words, your old man. Me too (times about a million). Googling Canna as we speak! Jesus Eve, if your novel is written any way as good as that last blog, you’ll be selling books like Jodi Picoult. And yes, that was one of the best meals ever. Sorry Eve didn’t realize that wasn’t you’re last blog. Picked it up on Brigid’s facebook. Still love the way it’s written though……..
Well it was sort of the blog! Thanks for all the feedback Mick – really appreciate it. She was! At least 2 seconds.